Mainstream astronomers have been claiming for years that Enceladus harbors a warm global ocean just under its icy surface. Now, with scant evidence, NASA scientists claim this ocean is being heated by active hydrothermal vents and may even support alien life. Scientists claim Saturn’s moon Enceladus is covered by a global ocean just under its icy surface. This ocean is supposedly heated to such a degree that it boils over and escapes into space through cracks in the ice. Last week NASA scientists claimed in the April 14, 2017 edition of the journal Science that this ocean contains hydrothermal vents like those found in Earth’s oceans and therefore might even harbor life! All of these conclusions are derived solely from the analysis of the heat and plume of material being emitted from a series of cracks in the surface ice, called the “Tiger stripes”, in the south polar region of Enceladus. The authors of the Science paper go through enormous pains to describe how the Ion Neutral Mass Spectrometer (INMS) aboard the orbiting Cassini spacecraft was used to detect H2 in the aforementioned plume. There are also detailed explanations of how the H2 could be generated by hydrothermal vents and how this could be used as fuel by living organisms. However, all of these descriptions and explanations are based completely upon theories and suppositions. There are no subsurface radar images of oceans beneath Enceladus, no seismic testing has ever been conducted there, neither has any drilling beneath the surface been performed nor any samples from there ever been recovered. The only direct analyses have been of the composition of the plume emitted from the “Tiger stripes” and the heat generated in that area. 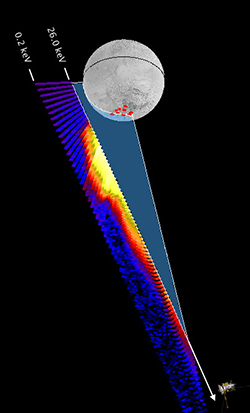 Observations from the Cassini Plasma Spectrometer (CAPS) made during the Cassini flyby of Enceladus on 12th March 2008, superimposed on Cassini’s path. Several alternative processes for generating hydrogen are discussed and dismissed in both the main paper and supplementary materials. Interestingly, one of the dismissed processes is the radiolysis of surface ice by “magnetospheric plasma”. This is because it is supposedly a global phenomenon that only occurs at the surface and because it produces excess oxygen which was not detected. But then the authors continue by writing that “shearing of water ice mixed with silica particles along the tiger stripe faults could generate H2” but “the ice on Enceladus may be too silica-poor to permit appreciable production of H2”. The last part, like most of the paper, is a total guess as the authors have no way of knowing the silica content of Enceladus. And because of their guessing, the authors in a single paragraph have both described and dismissed the actual mechanism of H2 production at the “Tiger stripes” of Enceladus. The authors’ quick dismissal of magnetospheric plasma is a bit surprising considering that NASA’s own instruments and research have revealed what an important role plasma along with magnetic and electrical forces play in the plume and heat emanating from Enceladus’ south polar region. 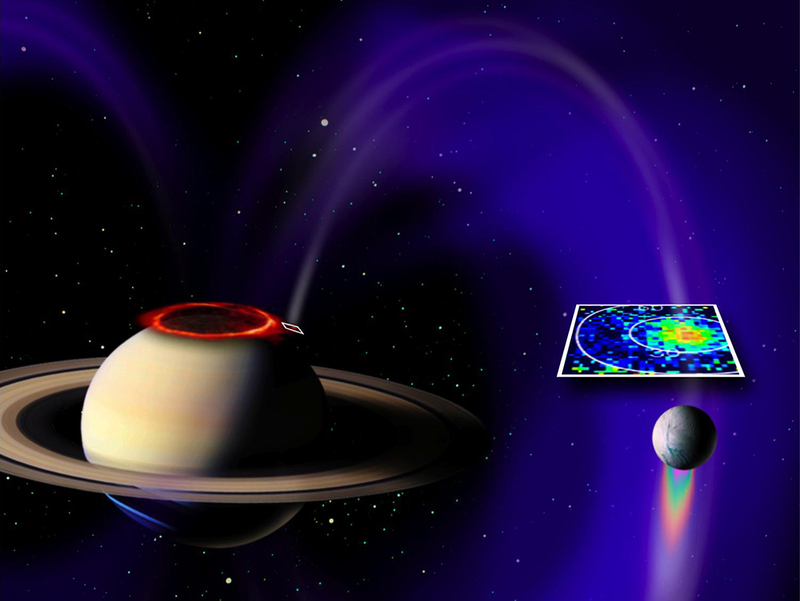 In 2008 NASA’s Cassini spacecraft detected the powerful “electrical circuit that connects Saturn with Enceladus and accelerates electrons and ions along the magnetic field lines” as described in this online article. As the accompanying illustration shows (see above), that circuit is through the poles of both the planet and its moon. It is so powerful that it is visible as an ultraviolet aurora the size of Sweden in Saturn’s north polar region and as a large number of visible jets of ejected material forming a plume that extends hundreds of miles into space from Enceladus’ south polar region. In 2009 the Royal Astronomical Society reported in this press release that a team of planetary scientists using the Cassini Plasma Spectrometer (CAPS) instrument had discovered “tiny, charged icy particles in the plume from Saturn’s moon Enceladus”. The particles are only a few nanometers across but they have both positive and negative electrical charges. And fascinatingly, the particles that make up the individual jets which form the plume are separated according to charge, with negative grains on one side of the jet and positive ones on the other. In 2010 a team of scientists posted this paper in the Journal of Geophysical Research describing “Joule heating of the south polar terrain on Enceladus”. In their paper they postulate that the interaction of Enceladus with Saturn’s magnetic field generates a small amount of heating and plume activity in the “Tiger stripes” in Enceladus’ south polar region. They write that the amount of heating and activity depends on magnetic field strength, plasma velocity, the length and volume of the fractures, and the conductivity of the material in the fractures up to a few kilometers below the surface. And although the authors conclude that this “Joule heating” cannot explain the total amount of heating and plume activity in the south polar terrain, they do clearly demonstrate a strong mechanism for electrical energy transference sustained by magnetospheric plasma interaction. The authors of the last paper describe many parameters that can significantly affect how much energy this plasma interaction contributes to the heating and plume activity of the south polar region of Enceladus. Their own proposed range of energy contribution spans a factor of 250 while their proposed range for the magnetic field power itself spans a factor of almost 350. This clearly demonstrates just how little data scientists have available to them and how variable this lack of data can make their models. What if the authors’ ranges were increased by another factor of 250? Or even 350 or more? These levels of energy contribution would account for the vast majority of the heating and plume activity. They would explain the source and amounts of H2 detected including its localization. Such an enormous transference of electrical power could also produce a shearing action on and below the surface of Enceladus. This could free silicon, carbon and other elements allowing them to bond with oxygen and some of the hydrogen formed during H2 production. This could account for much of the SiO2, CO2 , CH4, NH3 and heavier hydrocarbons and organics detected in the plume — and its lack of oxygen. There are many more results in the body of scientific research that point to a magnetic/electrical relationship between Saturn and the heating and plume activity of the south polar region of Enceladus. Most of the processes described in this research can not only be directly tested, but they can be tested under rigorous laboratory conditions. But additional ground-based observations are needed along with additional spacecraft visits to gather more data. The greatest unknown at this point is what exactly lies under the surface of Enceladus. What if it turns out to be only rock or just a thin slurry of ice, salts and minerals? Unfortunately these discoveries would hold little interest outside the scientific community and today even inside it. Instead, it is easier to perpetuate the idea of undersea vents in a vast global subsurface ocean harboring alien life forms. These fanciful conjectures make for eye-catching news and increased public awareness that is hoped will bring continued funding for pet projects and institutional careers. As a final note, I’d like to point out that despite all the detailed conjecture in favor of hydrothermal ocean vents under the surface of Enceladus, nowhere in the Science paper is an explanation proposed for how these vents might exist in the first place. Apparently just the idea of their existence alone is enough to garner attention and allow for the continued waste of valuable scientific resources, even if many times those resources are funded by the public for the good of all the public. 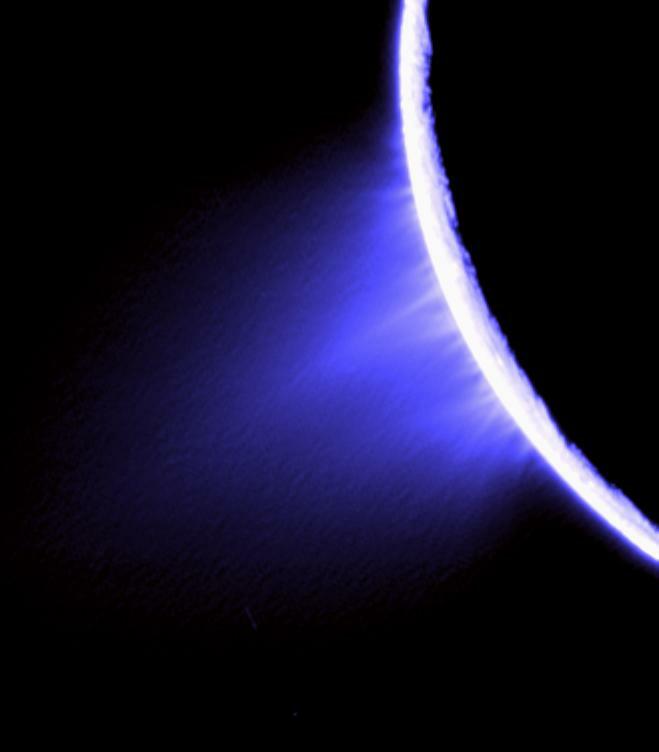 4 comments on "Enceladus Hydrothermal Fantasy"
Shannon Sims what is described in this article is much of what I am describing in this “The Planetary Society “ article on Enceladus. What is this group that produced this article about? Do you have regular publications and some sort of agenda? It’s not a group, just myself, and my goal is to try to publish at least 4 articles per year. You can read about the site and its purpose by checking out my about page here. I have seen from some of your previous articles you have people who have responded even with mathematical data to go along with some of your assertions. I don’t know if you read my comment on the Enceladus hydrothermal article in the Planetary Society article which was right after mine. If you get a chance please read it. One of the biggest problems I have is not being able to do the math. Please post a link to the article and I’ll be happy to have a look. I do not see a link in your original comment.